Humans like flowers respond best to a little tender loving care. Yes you do have to hug them, but a few clues about what they are like is likely to result in them keeping their perkiness for even longer! 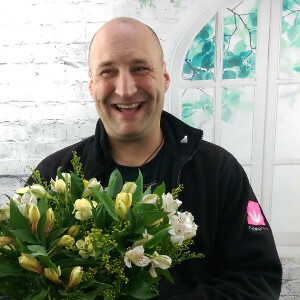 Our flower team is filled with people who have decades of experience right down to our trainees, taking their first steps into the bouquet creating world. Their role is, as you can imagine, picking, arranging and packing the flowers ready to be shipped off to our waiting customers. They are always working away with their industrious work ethic and radiant smiles. The smallest department within Clare Florist but arguably the most important (detect the bias) is our IT Team who are responsible for everything from the website to the clocking in machine, if it requires electricity to power it, it falls under their jurisdiction. Powered by the local food van and rock music they keep the web working, twitter tweeting, mailers mailing, facebook facing and blog blogging. Everyone else falls into our back office team as they don’t fit into either of the other two. Being made up of our buyers, office managers, accountants, customer service and directors it’s the group of people that make sure the numbers get crunched, the staff get paid, the customers are happy and the flowers we get are of the highest quality.